There´s more entertainment in your TV than ever before with OTELCO Digital TV. You choose the packages that best serve your family. Start enjoying your TV again! Parental Controls and STB (Set Top Box) / Receiver Security Features, gives you complete control of your family’s Digital TV content and viewing options. An additional 4 pay-per-view channels deliver more hit movies and sports. Easy-to-use on screen interactive program guide allows you to just point, select, and view. Great digital entertainment without the hassle of a dish. Arab area channel line-up may vary slightly. Otelco is now taking orders for our Digital, HD and DVR services. *Cable TV service is not available in all areas, contact your local OTELCO office for details. Customers in Vermont can now enjoy Internet TV thanks to Green Mountain Access (GMA) Video. With GMA Video your local channels are at your fingertips alongside Netflix, Amazon, Hulu and more with a Roku streaming appliance. GMA Video powered by OTELCO works with current generation Roku LT, 1, 2, 3 players and Streaming Stick. Need a Roku? You can purchase one through us if you’d like! You can even watch on your iPhone, iPad, iPod Touch, or with Safari on your Mac desktop or laptop with the GMA Video App. GMA Video Internet TV is only available to OTELCO’ high-speed Internet customers in Vermont. Please note that for best streaming service, at least 6 Mbps Internet speed is suggested. 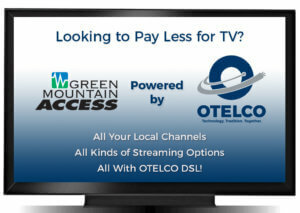 * GMA Video powered by Otelco service is available to Otelco high-speed Internet customers in Shoreham VT only. Requires Roku player, Internet speeds of a minimum of 4Mbps, a wired or wireless router to connect the Roku player, a high-definition TV and HDMI cable. GMA Video powered by Otelco service is not available in all areas. Roku service activation requires a Roku user account which requires a valid credit card. A wide variety of Roku channels are available; some are free, while premium services are fee-based. Any additional charges will be billed to your Roku account. Monthly service rates are exclusive of taxes and other governmentally sanctioned fees and charges. After first month monthly service charges will apply unless customer returns equipment and cancels service. There is a $10 installation fee. Contact us for complete details. Choose the package of TV and Internet or TV, Internet and Phone that best meets your needs and budget. We offer several different Channel Line-Ups and Internet options.